VODA – coming to a venue near you! 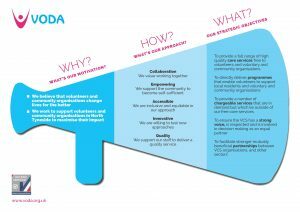 VODA and the services we offer are available across North Tyneside and although we are based in North Shields we are keen to make sure that volunteers, groups and organisations across the borough know who we are and what we do. We have recently launched a new visual representation of our vision and plans – see picture above – and offering an outreach service is just one way of making sure these plans happen effectively. There is no need to book a place at any of these sessions – just pop along to talk to one of our friendly team to find out how VODA can help. Thank you for your booking: VODA – coming to a venue near you!. We will be in touch soon to confirm your place.